In LMT’s joint survey with Dental Economics, 46% of dentists say they’ve switched their primary laboratory—meaning the one they use most often—in the last five years. Here’s what leads them to end laboratory relationships and what they look for next time around. The more things change, the more they remain the same: while dentistry has undergone unprecedented changes over the last 25 years, the number-one reason dentists switch laboratories has steadfastly remained the same: inconsistent quality. Dentists first told us this in 1994 and have emphasized it in all of our dentist surveys since, including the most recent one conducted with Dental Economics (click here for survey demographics), where 71% said inconsistent work was the impetus to end their relationship with their last laboratory. The unpredictability of what they might receive from the lab hits dentists where it hurts the most, costing them chairtime and damaging their relationships with patients. 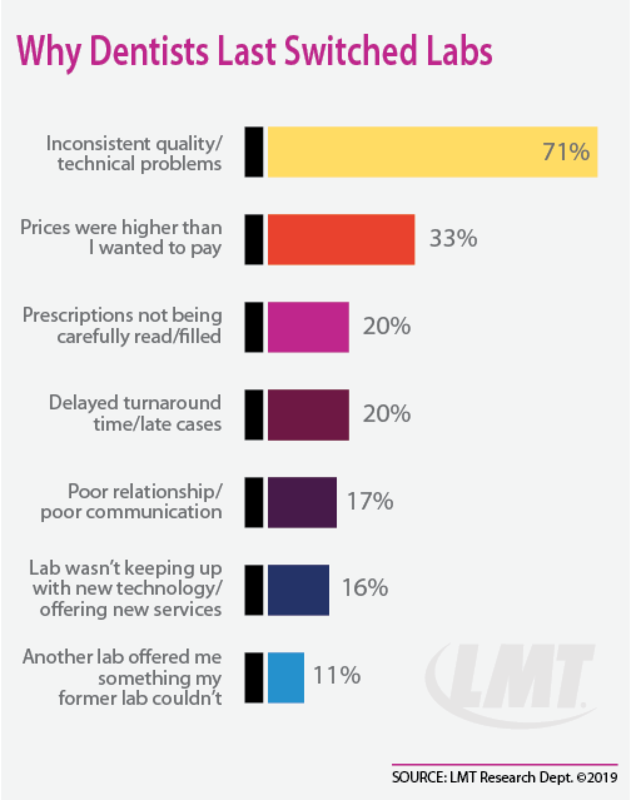 Although laboratories have long lamented price-shopping dentists, price is a distant second to inconsistency, with only a third of dentists saying it was a factor last time they switched labs (see chart). In fact, the majority of dentists say they expect labs to increase prices once a year or every two years. While this seems at odds with what we hear from laboratory owners, it likely comes down to a misperception: what laboratory owners may perceive as shopping for price, dentists view as shopping for value. In other words, the prices they’re willing to pay are in direct correlation to their estimation of the quality of service they receive. For example, one dentist switched from his last lab because a fee increase and reduction in staff coincided with a perceptible decline in quality; he suspected the lab started outsourcing without acknowledging the change. Another dentist says he knows he pays higher-than-average lab fees but feels the ease of the relationship and excellent work are worth it. 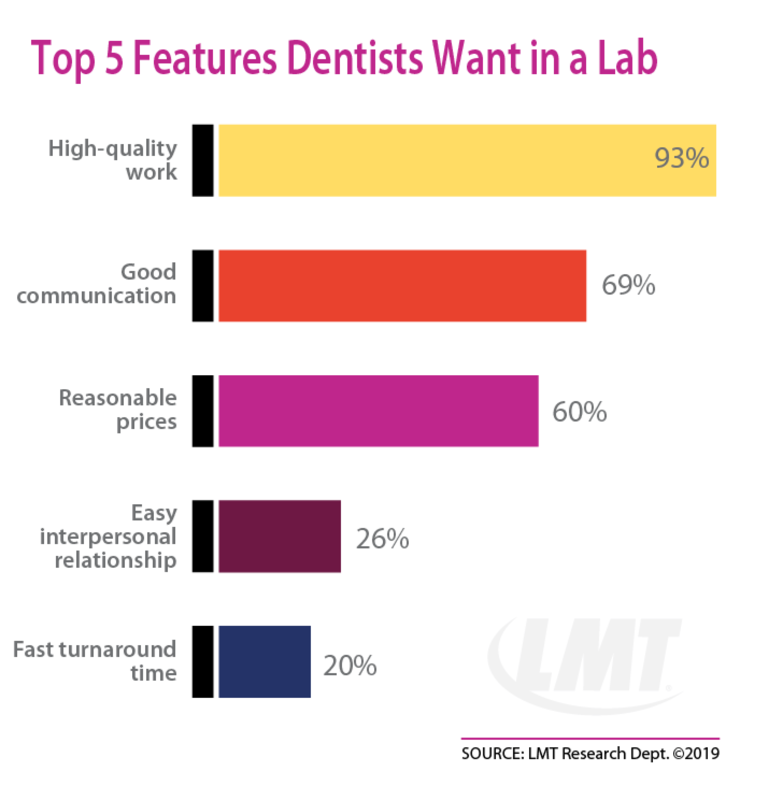 When dentists are ready to make a move, the top features they look for in a new laboratory are high-quality work, good communication and reasonable prices, in that order (see chart). To find that new lab, they value their colleagues’ advice more than anything else; in fact, 44% of dentists say a referral from another dentist is how they found their last laboratory. They also respond to in-person sales calls and seeing samples of the lab’s work. In all this talk about switching, let’s not overlook the fact that many dentists are relatively loyal to their laboratories: in the past five years, half of them have NOT switched their primary laboratory. This entry was posted in Dental Labs. Bookmark the permalink.